Habiburrahman El Shirazy born in Semarang, Central Java, 30 September 1976, started his secondary education at MTs Futuhiyyah first Mranggen yellow books while studying at boarding school Al Anwar, Mranggen Demak under the care of KH Hamzah Abdul Bashir. In 1992 he migrated to the cultural city of Surakarta to study at Madrasah Aliyah Special Program (MAPK) Surakarta, graduating in 1995. After that continued intellectual odyssey to the Faculty of Islamic Theology, Department of Hadith Al-Azhar University, Cairo, and completed in 1999. In 2001 graduated Postgraduate Diploma (Pg.D) S2 at The Institute for Islamic Studies in Cairo, founded by Imam Al-Baiquri. While studying in Cairo, Egypt, Kang Abik never led the study MISYKATI (Assembly Knowledge Intensive Yurisprudens and Islamic Studies) in Cairo (1996-1997). Never elected to the ambassador of Indonesia to follow the "Second International Islamic Youth Camp" organized by WAMY (The World Assembly of Moslem Youth) for ten days in the city of Ismailia, Egypt (July 1996). In the camp, he had the opportunity to give a speech entitled Salam Fil Tahqiqul Amni Was' Natural Numbers Islam (Actual Security and Peace in the World and Islam). Oration was selected as the second best speech of all speeches delivered these campers. Been active in the Assembly Synergy Kalam (Masika) ICMI Orsat Cairo (1998-2000). Islam had been a coordinator ICMI Orsat Cairo for two periods (1998-2000 and 2000-2002). Young writer was once believed to sit on the Board of Scholars Nahdhatul Asaatidz Virtual Boarding School, based in Cairo. And had initiated the establishment Forum Rim Pena (FLP) and the Indonesian Literary Community (KSI) in Cairo. While in Cairo, he has produced and directed several plays, among them: Wa Islamabad (1999), The Kyai and the wicked (spin on the work of Dr.. Yusuf Qaradawi called 'Alim Wa Thaghiyyah, 2000), Blood of Martyrs (2000) . Reading his writings titled Insanniyah al Islam contained in the book Universal Islamic Discourse (published by the Review Group MISYKATI Cairo, 1998). Opportunity to become Chairman and Editor TIM Codification of State Poetry Anthologies thousand Breath Tower Civilization (published by ICMI Orsat Cairo) Some translation work he has produced as Ar-Rasul (GIP, 2001), Biography Umar bin Abdul Aziz (GIP, 2002), Cleanses Soul (GIP, 2005), Rihlah Ilallah (Era Intermedia, 2004), etc.. Short stories published in anthologies When Sorrow Smiles (FBA, 2001), Red in Jenin (FBA, 2002), and When Love found you (GIP, 2004). Before returning to Indonesia, in 2002, he was invited Languages ​​and Library Board Malaysia for five days (1-5 October) to read in a moment pusinya Kuala Lumpur World Poetry Reading 9th, with poets in other countries. 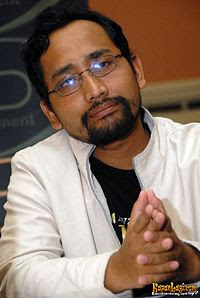 His poetry was published in the World Poetry Anthology PPDKL (2002) and the Council of Literary Magazines (2002) published by the Language and Library Malaysia in two languages, English and Malay. Together with other countries poet, poetry kang Abik also reprinted in PPDKL Appeal (1986-2002), published by the Language and Library Board Malaysia (2004). On arrival in the country in mid-October 2002, he was asked to mentashih Dictionary Popular Arabic-Indonesian compiled by KMNU Egypt and published by Library Diva Jakarta, (June 2003). He also asked to be a contributor to the Encyclopedia of intellectualism boarding school preparation: Images of People and Their thinking is, (consisting of three volumes ditebitkan by Diva Library Jakarta, 2003). Between 2003-2004, he dedicated his knowledge in MAN I Jogjakarta. Furthermore, from 2004 to 2006, he became professor of the Institute of Islamic and Arabic Language Teaching Abu Bakr Siddiq UMS Surakarta. The novelist now living in Salatiga. Daily activities more widely used for the invitation of charge seminars and lectures, as well as writing a novel whose main job and occasionally write for a soap opera scenario Sinemart (a production house that overshadowed his work in film and persinetronan). Kang Abik, the novelist is always called her sisters, during in high school once wrote a poem called Dhikr Dajjal theatrical directing at the same time with the play at the Arts Theatre Mbambung Sriwedari Surakarta Puppet People (1994). II champion won the race to write articles as MAN I Surakarta (1994). I had been a winner in the race of religious poetry reading high school level as Java (held by the committee and the ICMI Orwil Fair'94 Book in Semarang Central Java, 1994). Winner of the speech contest youth level as the former residency of Surakarta (organized by Jamaat Masjid Nurul Huda, UNS Surakarta, 1994). He is also the winner of the first race speech in Arabic as Central Java and Yogyakarta organized by UMS Surakarta (1994). Reaching Champion read Arabic poetry contest held by the National level IMABA UGM Jogjakarta (1994). Never aired on radio for a year JPI Surakarta (1994-1995) filling the Quran Syharil Every Friday morning. Ever the best to be the winner in the race KIR-5 senior secondary level as that held by the Central Java Regional Office of P and K Java (1995) with the title of the paper, Impact Action Movie Personality Of Youth. Some other prestigious awards he has made, among others, the Pen Award 2005, The Most Favorite Book and Writer Award 2006, 2005 and IBF. Of his novel "Verses of Love" she has obtained a royalty of more than 1.5 billion, while that of the other books do not lack the hundreds of millions he already pocketed. Some popular works have been published, among others, When Love Fruitful Heaven (MQS Publishing, 2005), the fading charm of Cleopatra (Republika, 2005), Ayat-Ayat Cinta (AP-Basmala, 2004), Above Sajadah Love (have disinetronkan Trans TV, 2004), When Love (Republika-Basmala, 2007), When Love 2 (AP-Basmala, 2007) and In Love Mihrab (AP-Basmala, 2007). The sky is now finalizing Makkah Color Red, Angel Eyes Bening, Honeymoon in Jerusalem, and from the Prostration Prostration (continuation of Love Mix). Besides novelist, scholar Al-Azhar University, Cairo, Egypt is also known as a director, preacher, and poet. His works are in great demand not only in Indonesia, but also in foreign countries like Malaysia, Singapore, Brunei, Hong Kong, Taiwan and Australia. The works of fiction considered to build a life and grow the spirit of achievement reader. Among the works that have been circulating in the market is the Ayat-Ayat Cinta (have made the film version, 2004), Above Sajadah Love (have disinetronkan Trans TV, 2004), When Love Fruitful Heaven (2005), fading charm of Cleopatra (2005 ), When Love (2007), When Love 2 (December, 2007) In the Mihrab Love (2007), Earth Love, (2010) and The Romance. The sky is now finalizing Makkah Color Red, Angel Eyes Bening, and Honeymoon in Jerusalem.